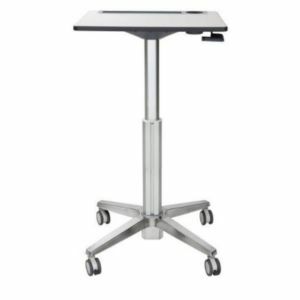 To attain a comfortable posture while the classroom lecture is going on, choose the Ergotron LearnFit Adjustable Standing Desk. This standing desk transforms classrooms into active learning environments with on-demand sit-stand desks. With the simple squeeze of a hand lever, kids can easily change their sitting arrangement as per their comfort level. This adjustment capability, along with the desk's ease of mobility, provides an educator unparalleled flexibility in arranging their classroom for the lesson. This LearnFit Standing Desk is ideally optimized to provide sit-stand adjustment for students in grades 7 through adult when using standard classroom chairs for seating. Hence, without thinking much, go ahead and place the order for the Ergotron LearnFit Adjustable Standing Desk right away!